The Harriet Tubman Boosters is not affiliated with the Harriet Tubman Home. ​who has generously shared his design with us. Sorry, T-shirts only available to members. Orders are placed once/month, so please expect 4-6 weeks for delivery. Mail in a membership form or join and pay online. See the drop down box below for the various membership levels. If you would like to set your own membership level, please print out the membership form and mail it in with your payment. Upon receipt of payment, a membership card will be mailed to you. Watch the recorded video of the Town Hall Meeting on August 26, 2015 celebrating Women's Equality Day and promoting Harriet Tubman on the $20 bill. Note: To print as a brochure, we suggest you bring the files to your local copy store. 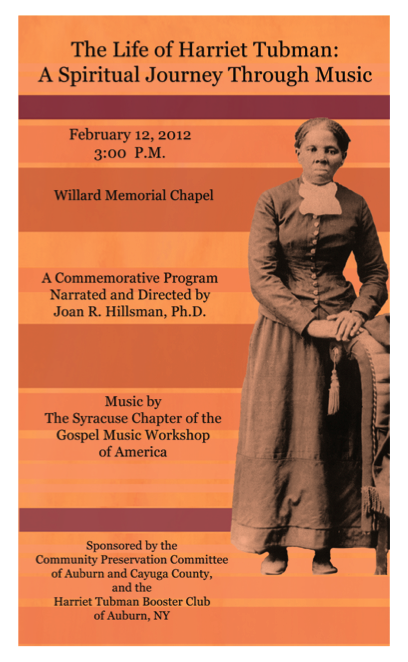 Watch a video of the Tubman Property with music by the Syracuse Gospel Music Workshop of America! If you are interested in becoming a member of one of our Committees please click on Contact Information above to fill out a Contact Form or e-mail us at harriettubmanboosters@gmail.com. Thank you. We look forward to your participation in any capacity.